I told myself it was because we were going on a long road trip and I needed something to keep me busy. Why was a making excuses? I also needed crayons. I bought the biggest box of crayons you could find. Go big or go home. Tons of colors. Again, Target or Amazon for less than $10. Then it hit me. I had the best idea! My future children will have an art table with all of the supplies they could ever need to be creative. Talk about thinking ahead. I am all over it. Remember when I talked about JoJo and Chip Gaines in this post? Well, they again were my inspiration for this brilliant idea. Thanks Jo! I started with a simple sketch of what I wanted it to look like. The 'box' part is 13.5 inches x 5.5 inches. The sides are 12 inches tall. 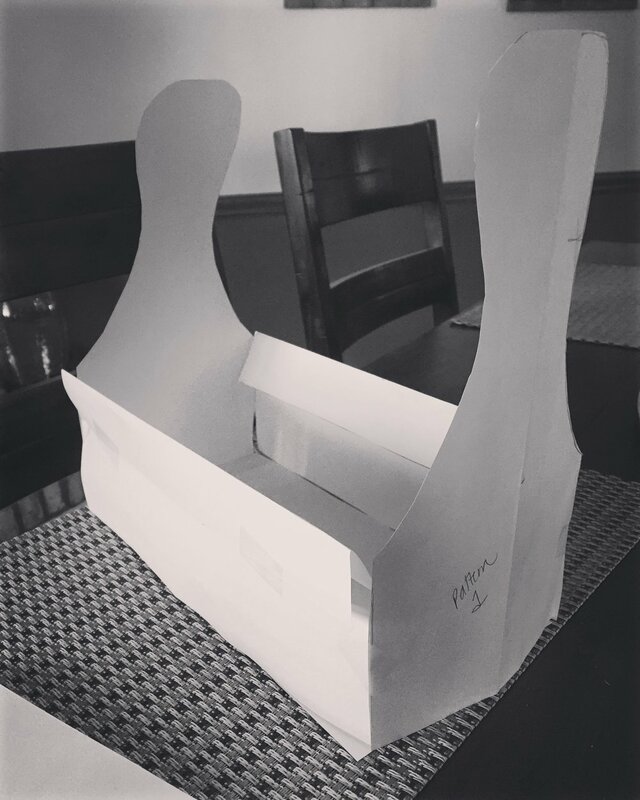 I then created actual size templates for the pieces of the box and taped them together. Then it was time to build. I used my templates and traced the outline onto each piece of wood. (I didn’t have to spend any money on this project, as all of the wood came from the scrap box!) 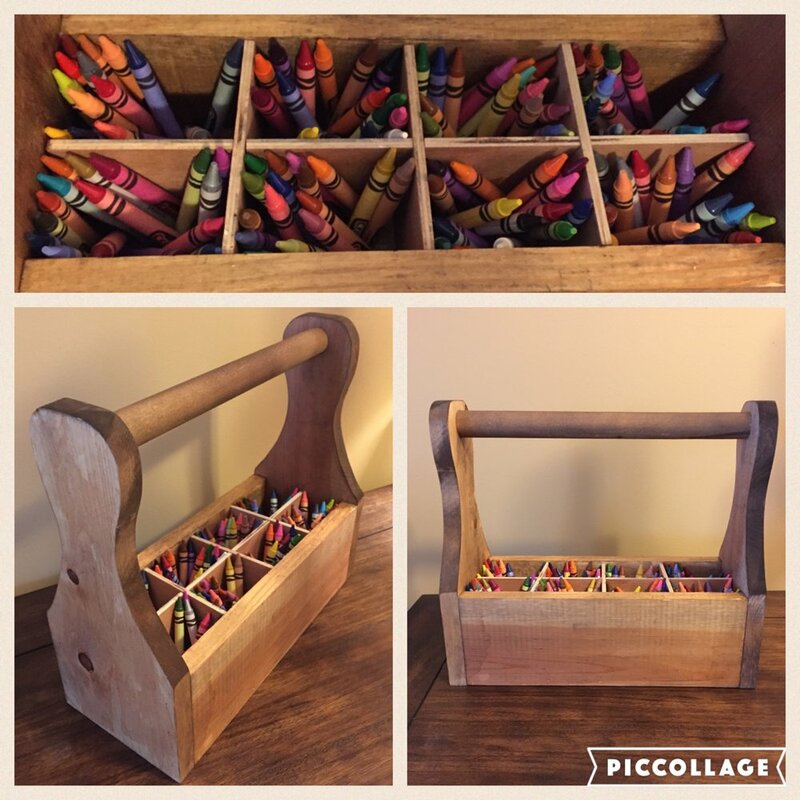 Each piece was cut out, sanded and the glued together to make the crayon box. I also used the nail gun for some reinforcement. Oh yes, I also needed a handle to carry the box and some sections inside the box for all of my crayons. The handle is a simple wooden rod, cut to size (12 inches) and glued in place. The sections are small pieces of plywood, cut to size and interlocked together for stability. This would be a wonderful Christmas gift for a child or even an adult who loves to be creative! But wait. What's that? You aren't into 'building'? Well, I have another option for you! I found this at my local antique shop. It was originally wood and I painted it white. You could easily put a handle on this (or not) and insert a few sections to create an art box or crayon box. Oh yes, one more thing. If you like this idea, please share it with others! It's an easy way to organize art supplies, and for a bonus it's cute. Newer PostLife as a racing dog. Older PostDecorating for Christmas with an 'under construction' home.